Since last monday, the 2009 edition of the Summer of Code is over, so it’s time for a summary of the work of my project, what has been done, what has not been done, and what I am doing right now; while reading this, keep in mind the picture you see above, taken from one of the most recent code snapshots of the smartsave dialog system. My project for the GSoC had the aim of developing an alternative semantic load an save dialog system, through which the user would be able to save meta-informations and interrelations about its files, like associating the current context or the current project, or the pdf version of an OpenDocument file; during the opening operation, a new view of the file system would be produced, so the user should navigate and filter through the previously created metadata, narrowing the possible range of files until it finds out what he/she is looking for. This is a question that I often hear, especially from those people who think that a semantic desktop engine is not different from, for example, Google Desktop Search, or similar file crawlers; well, a semantic engine is very different from a crawler: the latter just passively crawls through tons of files, extracting text and allowing a search through keywords, while the former can combine its informations, using mathematical logic rules in a process called reasoning, for expanding the metadata associated to a document and allowing a user to search it through paths he/she hadn’t thought about when saving it. The semantic desktop is not just this, and a very good introduction to it can be found here: it is worth reading it, believe me. The new dialog system jumps straight into this view: saving files in the current way is somehow old, and it requires the user to create a reasonable directory path, so he/she will be able to find its file back someday, when he/she will need it; in my view, it should be very useful if we are able to associate to a document some informations, about its contents or about the contest in which we have created it, without bothering with a file system structure: wouldn’t it be easier to search for it later? Ok, so what do we have now? During this GSoC, I have created a new UI, similar in certain aspects but different in others to the current one; an interface to some plugins which are able to analyze file content and extract possible metadata, also querying some online services like OpenCalais; the user is also able to associate personalized metadata. The open dialog presents a full list of files, comprehensive of those indexed by Strigi, with a list of filters for narrowing the search; the filter system is very similar to the faceted browsing system which you can find on many Web sites. Currently, files are saved in ~/Nepomuk, with a file path that can be explored also through the standard file manager; the name and the path automatically given by the dialog backend is not *that* beautiful for now, but there are some development already planned. Reading from the original application, there is just the optional goal which has not been developed, and it consisted in a new view also for the file manager, allowing a file browsing similar to the open dialog one; unfortunately, time has not been enough to develop it too, but other developers are also working on a better file search UI for Dolphin, so there will surely be news in this field in the next weeks. 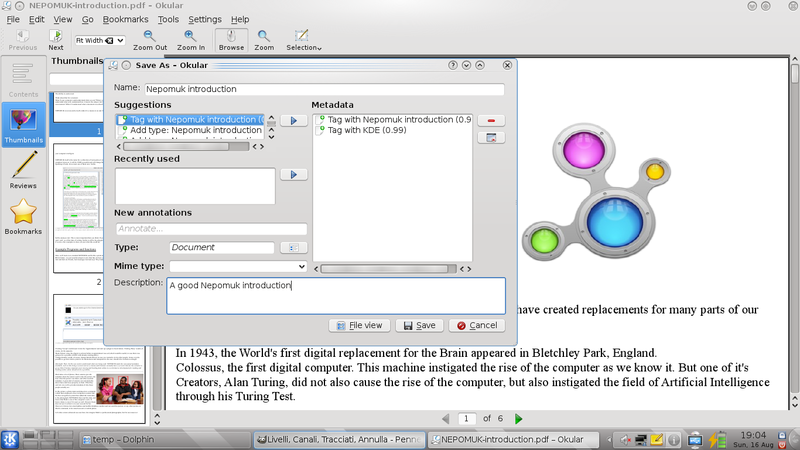 But there is a good reason for this: I am currently working in a little hack of kdelibs, for having the dialog shown as an alternative in all the KDE programs (like Okular in the screenshot, or KOffice in a previous post), so the code is now in an intermediate form and you will have to wait a little more to try it out. This is currently the main development target, with also a couple of todo items still in my list; there will also be new code coming up for the elaboration of the “real” file path, and more plugins for extracting more and more metadata automatically from the document to be saved. Here are some credits: I have to thank Nicola Vitucci, a great friend who gave me some very good advices, especially when I wrote my application; Sebastian Trueg, my mentor, for having helped me along these months (and for still helping me 😀 ), and for having stood for my very basic questions on Qt and KDE libraries; Adam Kidder and its GSoC project about kio-slaves, which I am heavily using in the open dialog, and all those people who commented my posts and discussed their views in chat with me: your opinions and ideas has been very important, and I hope they will be of the same importance also in the next days that I will spend with KDE and its community (yes: I’m staying with you)! So, stay tuned: some good things are coming out! As we are approaching the end of GSoC, little surprises along the way… more of this in the next entry, the next week, when the deadline will be passed. As promised, while I’m currently tweaking a few things out in the dialogs, here there are the compilation instructions for trying my code. No .deb precompiled packages (yet? ), a couple of passages were a little more complicated in relation to the time that I can give them, so you need to get a little dirty, but I’m sure that this is not a problem. As a premise, I assume you are a little confident with compiling sources, and you know what cmake is; given that, here we go! The following passages work for sure in Ubuntu Jaunty, updated to KDE 4.3 (oh, by the way: you need KDE 4.3 or better (that is: trunk) for all this to work), and I know this because my new shining laptop arrived last wednsday, so I did this to work on my code. You need at least kdelibs and kdebase packages (let me repeat: minimum version is 4.3, so if you are on Jaunty, you do need the backports repository and the upgrade operation, please refer to www.kubuntu.org for instructions), plus their development versions: kdelibs5-dev and kdebase-workspace-dev (pay attention: kdebase-dev is from 4.2.2); for any other missing library, cmake will tell you what you need. You can install it in /usr/local, but this thing is probably going to stop your strigi filesystem analysis: if you don’t care about it, then go and compile it; otherwise, I think you will need to install trunk in some different directory and work with it. As you may notice, you need to install that code in the same folder you have KDE, unfortunately it does not seem to work in /usr/local or similar folders (but any suggestion in this sense is accepted): as a consequence, it will overwrite the current kioslave from your packages. Again, if you don’t like it, then compile trunk in a directory different from the one of your standard installation. After the last command, everything should work. The installation passage is optional, because it will not install the testing application. 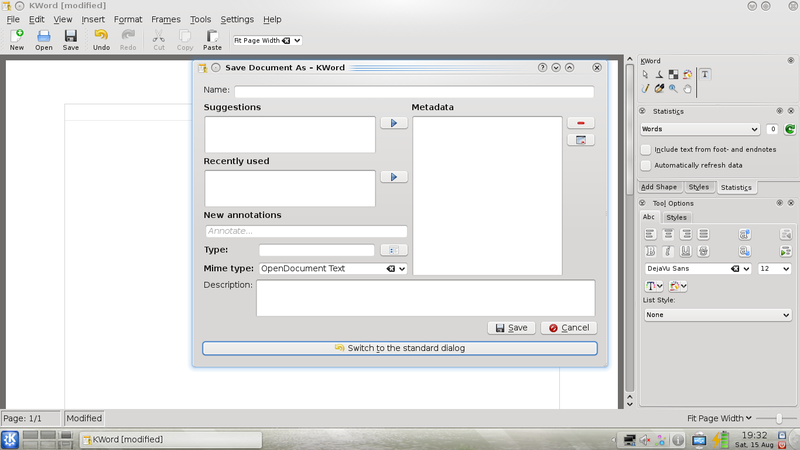 If you want to try the dialog, enter the test directory and launch the texteditor app: it is just the same simple notepad from Techbase tutorials, but with my open and save dialogs instead of the standard KDE ones. Some things can go wrong: the first one is that you see the standard dialogs in the test app, and if this happens, then you probably have shut down Nepomuk, please restart it from the system settings dialog. The second one is that you don’t get any suggestion in the save suggestion box: if this is true, then you can try by restarting the kde daemon, by invoking kdeinit4 from a console, so that the plugins installed before are registered. The third one is that you cannot see any file in the open dialog: if this happens, then you have to check that the kioslave has been correctly installed in your KDE main directory (/usr on a standard system, or something else if you work directly on trunk). Now that you have a text editor with the dialogs, what can you do? Well, I’m going to prepare a screencast, probably in the following week, to show a couple of features; bear in mind that there are some tweaks on which I’m working on, so this is not a perfect system or a system ready to be shipped in a stable release (far from that 🙂 ), so be patient and test, and feel free to report any kind of trouble you may find along the way. 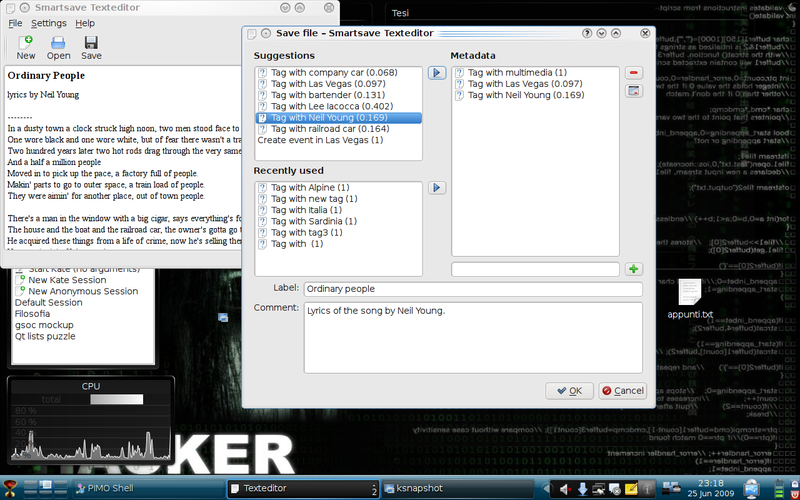 Yes, as you can see, now the open dialog is working! It took more time than expected, especially because of a couple of different approaches tried along the way (and some signal loops between models), but now a first basic version is there: as you can see, on the right there is a standard KDirModel, which is using Adam‘s code, the other GSoCer of Nepomuk, on kio-slaves, and it shows files; on the left, there is the filter view. 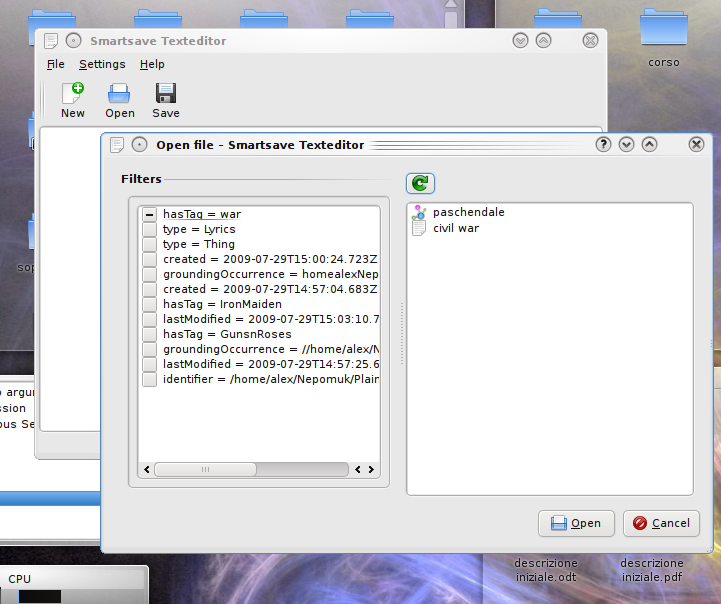 The filter view is still a work in progress, but it is quite similar to the faceted browsing systems you can see in many Web sites: there are properties and their current value, taken from the files shown on the right side, and the user can check them and restrict those files (and consequently the filters themselves become less in number). Of course, their visualization is very very _very_ basic for now, but it will become better, don’t worry about it! There have been also a couple of changes in the save dialog, especially in how the user can enter personalized informations, I don’t have a screenshot right here but a screencast will come, I promise, as soon as some things will be refined. Now, about the roadmap: only three weeks of official GSoC are left (17th is the last day “on the job”), so for that date I need to do a couple of important refinements in the base code, and some good work will go in the UI part, filters as one of the priorities; anyway the base dialog system is there, and that’s the first important thing. So, stay tuned! Anyway, tomorrow I’ll have another exam, and the last of the summer session is waiting for me on the 20th, and then it will be only SoC! And I promise to achieve that milestone next week, so expect a screencast coming, stay tuned! New screenshot, old screenshot: the dialog you can see here is almost the same as before, except that it now shows some recent annotations added to previously saved files, and a few suggestions have been loaded, thanks to the new shining Scribo plugin (by Sebastian Trueg) and to the OpenCalais public services (for those you will need an API key, after a free registration to their site, but anyway a nice popup will inform you of this, when you will try to use it for the first time). In that particular scene, I was saving lyrics from the song “Ordinary people” by Neil Young, and OC pointed out a few related terms, like the Las Vegas city written in the text, and others. Anyway, I have also made a little roadmap from now to the end of the GSoC (the BIG deadline), so the next important step will be a working load dialog (besides some little work on a couple of pseudo-bugs), so there will be a starting point for thinking about interaction with the user and UI. Last but not least, my Commander-In-Chief already blogged about the project on which Sebastian Faubel is working, and some ideas are very interesting, like for example a template-based filesystem tree for giving files a good place in which they can be saved (and browsed traditionally later).